Going out-of-town to eat? Sounds good to us! Take a long weekend off and pack your suitcases for an indulgent road trip you and your best friends need. From south to north, go as far as your car, and your appetite, can take you! Marcia Adams, the not-so-secret garden and rustic restaurant, is known as the Tuscany of Tagaytay, and rightly so! For just P700, you get a three-course meal that won’t disappoint. For a secluded yet intimately special dining experience, head to Milagros Private Kitchen. A lunch set menu for two is only P2,800 while the ala carte menu is available for groups of four or more. If you have the entire weekend to spare, they offer fun and easy two-day cooking workshops, too! In the mood for new flavors? Check out Bawai’s Vietnamese Kitchen, which offers delicious fare from one of Asia’s culinary gems set in a charmingly provincial home. This resto is definitely a welcome pause from Tagaytay’s bustle. Whether you plan to just eat or stay at Casa San Miguel, a bed & breakfast and café in San Antonio, a visit to this art, music, and nature haven is a must. Everyone who’s come and gone only has high praises for Casa San Miguel: from Backstage Cafe’s sumptious comfort food, their yoga sanctuary and Instagram-worthy nooks, the Anita Magsaysay-Ho Gallery and Museum, to the six-room B&B’s impeccable hospitality. Before heading to the heavenly Pundaquit beach, make a stop at the San Antonio Public Market. Catch the 6AM delivery of fresh yellow fin tuna along with other tuna species. Sample delicious Pinoy kakanin like nilupak, sapin-sapin, and suman here as well! A quaint burger, pasta, and pizza joint in San Antonio, make Detour Urban Kitchenette your last stop before you head to your next destination. Carbo load with their mouth-watering selections. You’ll need it for the long drive. Not far from San Juan Surf Resort is Gefseis Greek Grill. The authentic Greek restaurant, with the signature blue and white decor, overlooks the pristine beach. For just a little over P300, you can fill up with their delicious Souvlaki Platter, Poikilia, or their all-in-one plate dips. Staying in Flotsam & Jetsam Artist Beach Hostel is enough to fuel your artistic passions with their homey yet imaginative set-up. But the food is worth a try, too. The bar and coffee selections, along with the daily menu, get our two-thumbs up. But it’s the weekends that you should look forward to -- they have five-star pop-ups from big brands and sought-after chefs! Expect Surf Shack to be the ultimate surfer’s tambay place. The laid-back and hip open-air restaurant is where you can load up on locally flavored pizzas, fresh seafood, burgers, imported beers, and signature cocktails after a day of surf in San Juan Surf Resort just across. Warm up with a bottle of beer while in the summer capital of the country. Baguio Craft Brewery, with a chill rooftop bar that offers a view of Baguio, makes their beers right on the site. Make sure to order and take home their Lagud Strawberry Beer! There’s more heating up to do and the next best place to thaw at is Balbacua at Urban Kamote. They serve the famous Mindanaoan beef stew Balbacua extra special with the restaurant’s culturally artsy interiors. Located at the Ili Likha Artist Village, there’s more you and your BFFs should explore that will tickle the palate, and senses, while here. Can’t figure out what to eat but famished anyway? Head to Baguio’s local food mecca, KETCHUP Food Community. Eat your way through comfort food, Filipino, Indo-Malay, and Thai Cuisines at Green Pepper, Canto, Rancho Norte, Rumah Sate, and Happy Tummy. 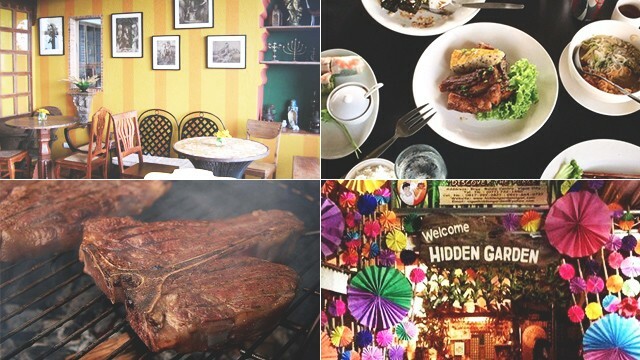 Take a break from touring the historical city and revel in authentic Ilokano cuisine amid lush greens at Hidden Garden of Vigan. Sample the famous empanada, ukoy, and miki or try their Longganisa Burger and Bagnet Sisig. In the heart of the city is Cafe Leona, named after Ilokano poet Leona Florentino who originally owned the house where the cafe is located. While the interiors will transport you back to the colonial Spanish period, the modern food selections will take you right back and while whetting your appetite. The best sellers are the Pinakbet Pizza, Caoayan Special Pizza, Bagnet Bacon Maki, and Longganisa Maki. For wallet-friendly but deliciously filling meals, Kuboville is the number one choice. The mix of Filipino and Thai dishes will keep you asking for seconds. Order the Tom Yum, Spring Rolls, and Locobaco.